It’s always interesting when things go “wrong” from our point of view. I truly feel as time goes on, terrible things that once perplexed me start to make a little more sense. The undesirable things tend to mix things up and shift your life to something even better. Remembering this important life lesson during trying times is key. Did you lose your job? Lose someone you love to the other side? Have the bill collections caught up to you? Did that amazing person you want to get to know become unavailable? Good. Feel that. Feel all of it. But then let it go. Let the universe take it’s course. Let the shifting situations around you naturally unfold. It can always be scary when we can’t see how things will work out. But that’s what faith is. According to Martin Luther King Jr., faith is taking the first step even though you cannot see the whole staircase. Taking a little step everyday amidst trying situations, that tend to fog up our vision, will lead you to an even better situation. Even in the worst of circumstances, at least you are learning. 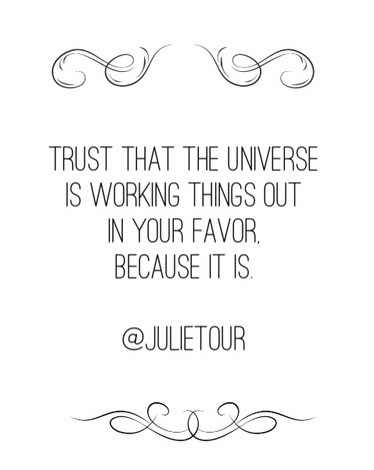 Have faith that the universe is working in your favor, because it is.